Maryland covers 12407 square miles and has a population of 5,296,486 people. 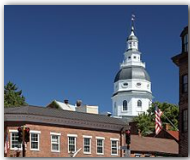 Maryland’s capital is Annapolis, which has a population of 35,838. Other important cities are Baltimore (pop. 651,154), Aspen Hill (pop. 50,228), Bethesda (pop. 55,277), Columbia (pop. 88,254), Dundalk (pop. 62,306), Ellicott City (pop. 56,397), Frederick (pop. 52,767), Germantown (pop. 55,419), Bowie (pop. 50,269) and Gaithersburg (pop.52,613). Maryland was admitted to the Union on April, 28th, 1788 as the 7th state. It’s bordered by Delaware on the east, West Virginia to the west, Pennsylvania to the north and Virginia to the south. The state flower is the “Black Eyes Susan” and it’s nickname is “Old Line State”. Maryland’s economy is broken into two categories; agriculture and industry. Seafood, poultry and eggs, dairy products, nursery stock, cattle, soybeans and corn provide for the agricultural side. While electric equipment, food processing, chemical products, printing and publishing, transportation equipment, machinery, primary metals, coal and tourism provide for the industrial side.